For over twenty years, Gemini Print have printed everything from business cards to brochures, beautiful books to disciplined directories and the whole spectrum of posters, leaflets, invitations, folders and manuals. They’re a long established business in Wigan with a vast knowledge from experience but also adventurous with the latest design technology. They also like to explore exciting new materials and to keep investing in equipment that will turn your work around quickly and cost-effectively. And that means you get the best job at the best price. Gemini Print’s old website wasn’t really reflecting their abilities and the quality of their services and products. I knew I was more than capable of creating something vibrant and creative to emphasise the fact that these are creative and talented people. 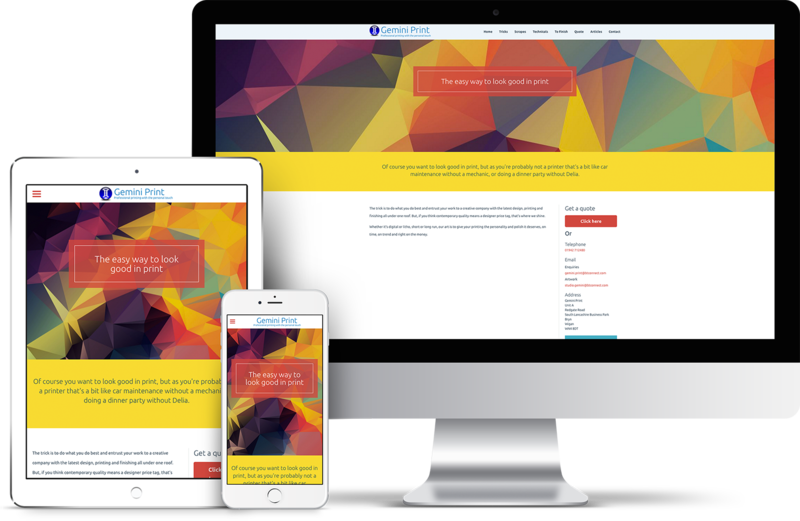 The solution to Gemini Print’s website was a complete overhaul. Starting from the beginning I took information from their old website and used that to rebuild a new website. The focus was solely on bright and vibrant colours that stand out. This is a creative industry and you have to demonstrate that you’re creative to compete with others. One focus point was to get an enquiry form which would guide users through a set of questions allowing Gemini Print to understand a project much better before providing the service and also allow them to send a preliminary quote. I designed this website from scratch starting with an initial concept and wireframe and moving onto the final designed website. Gemini Print has a really modern and contemporary look and feel with bright and bold colours leading the readers eyes. It’s also incredibly easy to use and navigate around so that all of their information is accessible. I used WordPress for this project as the basic CMS and built upon it to get the functionality the website required. This isn’t a complex website, taking advantage of the basic WordPress functionality and adding some additional functionality including the ability to add contact forms and a form to get a quick quote, track site traffic and optimise the website for search engines.